As technology continues to be a game changer in virtually every aspect of life, basic one-on-one human interaction remains irreplaceable. Chasse, a working artist and arts organizer for the past 10 years, has learned that creating, presenting, viewing, understanding, and appreciating artworks are evolving concepts and we live in a time of full of unchartered territory jumbled with time-honored traditions. 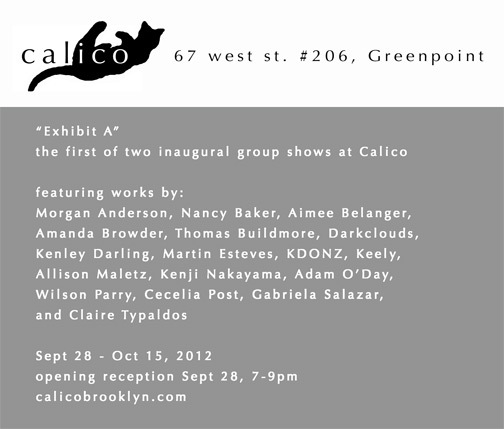 Calico, referring to the type of cat known for its medley of colors, will present a wide range of established artists and will draw from Chasse’s varied experiences over the years as both artist and presenter. The space and the exhibits featured within it will not be strictly DIY nor “white cube”, but rather a deliberate mix of elements from both. Fellow artists from New York, Boston, New Hampshire, and Philadelphia will be represented in “Exhibit A” and “Exhibit B” (“Exhibit B” opens on October 19th). Please join us for the opening reception on Friday, September 28, 7-9pm, sponsored by Narragansett Beer.